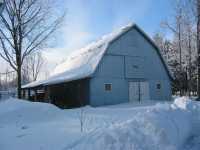 Big Blue Barn: Handheld doohickey? I am starting to think I need to give in and get myself some kind of electronic tether device, like one of those modern cell phones or some kind of other handheld device. I don't really need the cell part of it, as I rarely find myself wishing I could call someone (though I imagine that could change easily once I actually had a cellphone). But I am finding it hard to keep on top of all the "to-do" lists I have on the go, and even more importantly ;) the blog post ideas that pop up in the most odd places, like the dentist's waiting room. So in the interest of having my life flow smoother, keeping the number of to-do lists to a respectable 2 or 3 (instead of the dozens floating around right now), keeping better track of appointments and commitments, and generally be less frazzled at times (at least I hope so), I am convinced I need to get me one of those things. So if I have any readers left after my prolonged silences, if you have any ideas/suggestions let me know (via comments, emails, or whatever works for you, I am not picky). I haven't started looking yet, so any pointers at all are very much appreciated.